Looks great Lindsay. Is there any way of enlarging the pics for a closer view? Hope all are having a good time. Looks fabulous! Christina has already posted pics of the canvasses she and Carolyn made (during the morning workshop) on the AMOM website - plus pics of the pair of them with Tim. I'm sooooo jealous! David says right click on image, image opens in it's own page, click on view at the top, scroll down to zoom and each time you click zoom in the photo will enlarge. OK. Angie, I will try again, the problem is with certain blogs that have an HTML. problem. Ideally, one should be able to clck on a blog photo and it automatically enlarges,some (as this one),have lost their HTML. setting and the only other way to rectify this nuisance, is to close the blog and open a new one,which would be a *bind. So, once more, right click on the desired photo a window appears and the first instruction is VIEW IMAGE. Click this and the image opens in a new page. Scroll to the top of the page and click on *tools. This opens a window that includes *zoom in, zoom out. Click on *zoom in and the picture will enlarge. Each time you click on *zoom in, thephoto enlarges further. Hope that is clear! David. 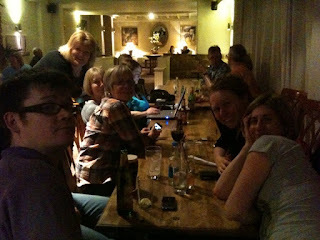 Enjoyed your blog and great photo's of you and friends. Looking forward to seeing you in Darlington again on Saturday.